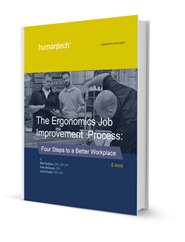 Workplace ergonomics, or improving the fit of the workplace to the worker, is about change—change to workstation layout, equipment, tooling, manual handling, and information flow. Through our many years of experience helping Fortune 1000 companies implement these changes, we’ve seen that improvements are best managed and tracked following a continuous improvement process. In other words, ergonomics is a “process”, not a “program”. This complimentary e-book shares the key steps you can take to make tactical changes that continuously improve the workplace. Through benchmarking studies, we've learned that companies who are successful in managing and controlling MSD injuries are those who manage ergonomics improvements as a process.